Rural communities across Manitoba active in age-friendly initiatives were featured in an exchange of practice, policy, and research. Forty eight leaders from eighteen countries around the world met for three days in Winnipeg to agree on initial pathways involving rural and remote communities to become more age friendly, promote intergenerational activities, engage seniors and encourage seniors to involve others of all ages in transforming places. Those gathered want to inspire people to make their communities more accessible for all ages. Dr. Salenger, Premier of Manitoba, opened the public forum for this symposium, hosted by the Centre on Aging, and sponsors included Age-friendly Manitoba, and collaborators included the International Federation on Ageing, World Health Organization and Brandon University’s Rural Development Institute (RDI). Dr. Ashton, director of RDI, spoke as a member of the key note panel, presented a photo essay on rural and remote places around the world, and facilitated a session with the local and global leaders. – (October). 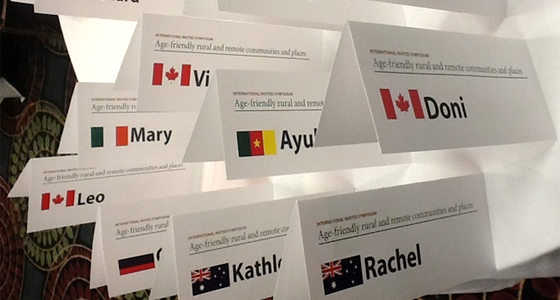 Presented at Age-Friendly Rural and Remote Communities and Places, Winnipeg, MB. Ashton, W.